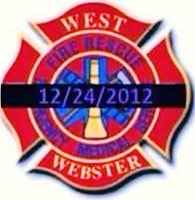 ~ The West Webster Fire District ~ this holiday season as the tragedy of this Christmas Eve morning leaves us shattered with disbelief. No words can truly console the loss, the anger, and confusion felt by all affected by this heinous act. Again our deepest sympathy and condolences to our brothers one town over for the horrific loss of Michael Chiapperini and Tomasz Kaczowka and severly injured Joseph Hofstetter and Theodore Scardino. May the lost rest in peace never to forget their selfless sacrifice, and may the injured recover quickly with strength of those around them. As for the call itself Penfield was called out Monday at 6:04 in the morning to supply one ladder to West Webster Station 1. As the crew responded it became very clear that it was not going to be a normal mutual aid fill in request. Penfield along with several agencies would stay six hours till noon providing coverage for the West Webster Fire District before being swapped out. Penfield's ladder was relieved by Egypts ladder at 12:00 Monday afternoon. 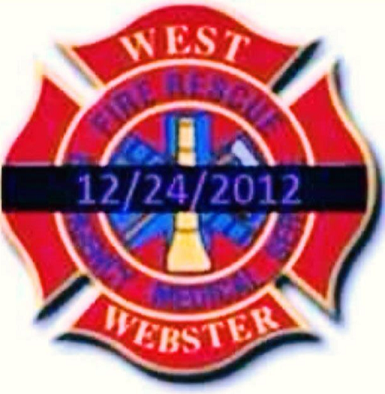 Twelve hours later Penfield again would supply ladder coverage to West Webster's Station 1 from midnight to six in the morning Christmas Day. Four of the six Penfield volunteer firefighters from the first shift would again spend a second six hour shift helping in anyway they could. Penfield's ladder was relieved by Hilton's ladder at six in the morning.